Our new “Grubs ‘N’ Fruit” is an ultra-premium complete diet that is designed to be an alternative to our regular Crested Gecko MRP formula. It features 50% real dried fruit, and 30% insect protein powder. It can be used in rotation with, or be mixed with, our Crested Gecko MRP to provide a more varied diet. This new formula has shown to be particularly attractive to the more carnivorous gecko species such as Giant Geckos (R. leachianus) and Gargoyle Geckos (R. auriculatus). It also gets a great feeding response from juveniles of other gecko species that are more insectivorous as young, such as Crested Geckos (C. ciliatus). We have long recognized the potential of using insect meal/protein powder as an ingredient, but to date, the only available commercial sources have been from China and other parts of Asia. Our quality standards at Repashy have forced us to reject these sources for fear of these insects being raised on agricultural/industrial waste and their potential to become vectors for the transmission of toxins to animals which they are fed to. Also, because of the high fat content of insect meals, they are prone to rancidity and require defatting to increase stability. The industrial way to do this typically uses chemical processes such as hexane extraction. To solve these problems, we have contracted to have insects grown for us right here in the USA, on a diet specified by us, and defatted using our own proprietary cold pressing process. This produces a stable “insect protein powder” that is approximately 60% protein and 10% fat. The insects we have chosen to use are Hermetia illucens, or the Black Soldier Fly Larvae, which are marketed under several brand names such as Phoenix Worms, and Calci-Worms. Our history with this insect species goes to its root in the reptile hobby. 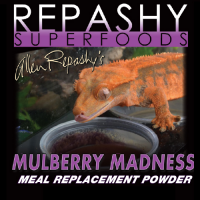 Some ten years ago, Allen Repashy was actually responsible for the introduction of the original “Phoenix Worm” into the Reptile trade as a live food item through his collaborative efforts with Dr. Craig Sheppard. These larvae have proven to initiate a great feeding response and have a very high nutritional value when compared to other insects. They are quite high in Calcium, and our protein powder test results have shown that they are approximately 2% Calcium and 1% Phosphorous. A perfect balance! With the introduction of these larvae into the hobby as a feeder insect, we immediately looked into the idea of using them as a source of insect meal, but at the time, production costs, and high demand for the more expensive live insects, prohibited this from becoming a reality. Recently though, with lots of research and development, the growing process has been refined to the point that developing a meal has become potentially economical. It is still a VERY expensive product when compared to other protein ingredients, but we feel that there are enough discerning customers out there now that are willing to purchase an ultra-premium product, that we could finally launch the formula. 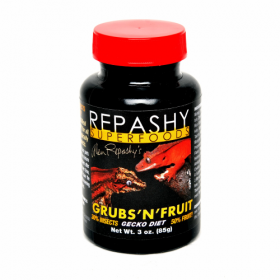 Grubs ‘N’ Fruit will make a great addition to our line of Gecko Diets. It is not designed to replace our Crested Gecko MRP, but rather to compliment it. Certain species, or individual animals, may prefer it over the standard formula. Grubs ‘N’ Fruit adds variety to the available food options, and provides the most natural source available of proteins, fats, chitin, and other essential nutrients for insect loving species. This new formula marks the introduction of our Insect Protein Powder into the Repashy line. We are currently developing, and will soon introduce, several other food products that feature this novel ingredient. This is a great formula! 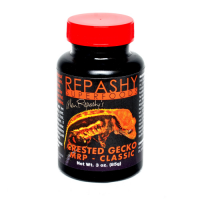 My gecko is a picky eater when it comes to using MRP (and not so picky when it comes to bugs!) and this was a great choice for him. He'll eat all that I offer rather than ignoring it. 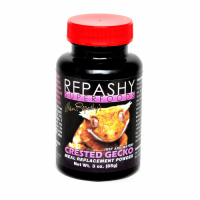 It was suggested to try this mix a bit ago by the great staff at Northern Gecko ... and my geckos love it! I mix one 12oz jar of this with the Mango Superblend, and it is well received by my growing collection. One of the best options around in my opinion!